This workshop manual is the most comprehensive manual available for repairing and maintaining your Mazda Rotary Pickup. 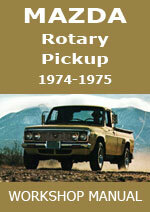 This Workshop Manual is for the 1974-1975 Mazda Rotary Pickup. Mazda Rotary Pickup 1975-75 Workshop Service Repair Manual $4.99 Immediate Download!